To keep them alive, young minority males should not be allowed to possess firearms, former New York City Mayor Michael Bloomberg said before a sold-out crowd at the Aspen Institute. The deep-pocketed Bloomberg is funding the gun-control advocacy group Everytown for Gun Safety that is currently pushing gun reform legislative proposals across the US. Bloomberg also called for increased vocational education so that schooling in the US can boost self-sustainability and self-dignity in children. He said opting to become a plumber is more practical and may be a better long-term decision than trying for Harvard. He touted New York’s service- and tourist-based economy, claiming that waitresses at the Waldorf Astoria Hotel, a landmark for rich visitors, can make $150,000 a year, and a waitress at a decent city restaurant can earn up to $60,000 a year. 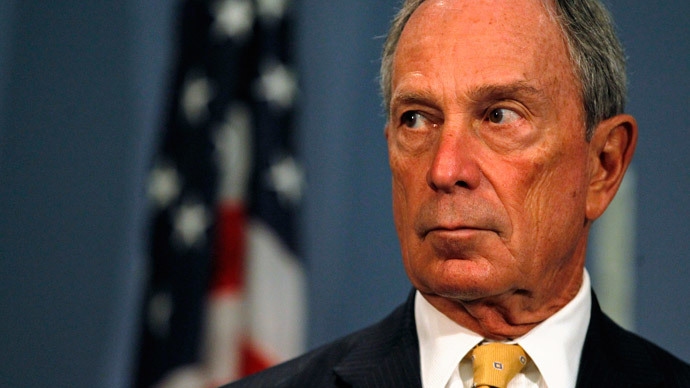 “It’s always the poor that get screwed,” Bloomberg said before the Aspen Institute. He added that he’d like to write a book about the cycle of poverty. New York City is a hotbed for income inequality in an America increasingly divided by uneven wealth distribution. The median rent in New York City for a newly-listed one-bedroom apartment in January was $3,000 per month, the second-highest sum after San Francisco. Bloomberg himself was worth more than $37 billion as of September 2014, according to Forbes, making him the tenth-wealthiest individual in the US. As New York City has become perpetually more difficult to afford in recent decades -- including Bloomberg’s three terms in office from 2002 to 2014 -- the city’s policing policies, including stop-and-frisk, have become more aggressive. While in office, Bloomberg and New York Police Department officials of his era said the stop-and-frisk program targeted minorities more often because they were responsible for a higher percentage of crime. However, only 11 percent of stops in 2011 were based on a description of a violent crime suspect. Furthermore, no research to this day has shown that stop-and-frisk has reduced violent crime. In fact, as stop-and-frisk policing has become more limited under Bloomberg’s successor, Mayor Bill de Blasio, violent crime has decreased as well. According to the NYPD’s 2012 statistics, while 84 percent of those stopped were black or Latino, the likelihood that an African American would have a weapon during a stop-and-frisk was half that of white New Yorkers stopped. When it came to discovering contraband, officers were a third more likely to find illegal items on a white suspect. Yet, statistics have shown that stop-and-frisk was lousy at recovering guns, as 0.2 percent of all stops yielded a firearm. While in Aspen, Bloomberg, 72, also slammed the trend of legalizing marijuana. He said the drug was more detrimental to the developing minds of children than alcohol.